Every summer I go on a quest. 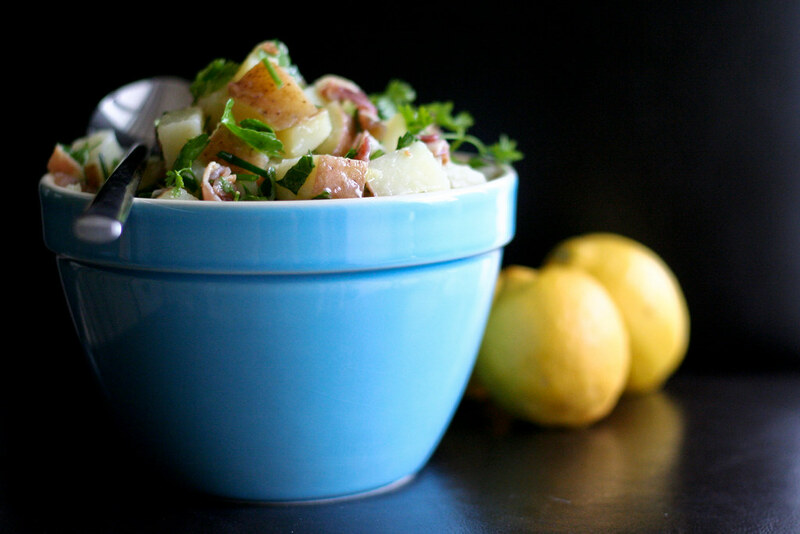 A quest to come up with something new and tasty for summer potlucks. It’s not as easy as you might think. There’s a reason why coleslaw and potato salad are BBQ staples. They’re cheap, life easy, sovaldi sale stand up to heat, denture and can easily be multiplied to make huge quantities. These were the prerequisites for my quest. Oh yeah, and it had to be really, really good. And appeal to foodies and picky eaters alike. I never said I didn’t love a challenge! So, when something has to appeal to everyone and be really good, I usually start with bacon. I used pancetta because I wanted a little bit of smokiness, but nothing overwhelming. And of course, potatoes are cheap and plentiful in the summer. To balance out the pork and starch, I made a really bright lemony vinaigrette with tons of herbs. The salad ended up being exactly what I needed. I took it to a BBQ on Saturday and everyone ooh-ed and ahh-ed. A quest completed, I now have a new addition to bring to the summer potluck circuit. Dice your potatoes into 1/2-inch cubes. I like to keep the peel on, but feel free to remove it if you prefer. Place the diced potatoes in a large pot, then fill it with cold water and set over high heat. Once the water comes to a boil, reduce the heat to medium and continue to simmer until the potatoes are just fork-tender, about 10 – 15 minutes. Stir occasionally to prevent sticking. When the potatoes are done, gently drain the pot and let them cool completely. 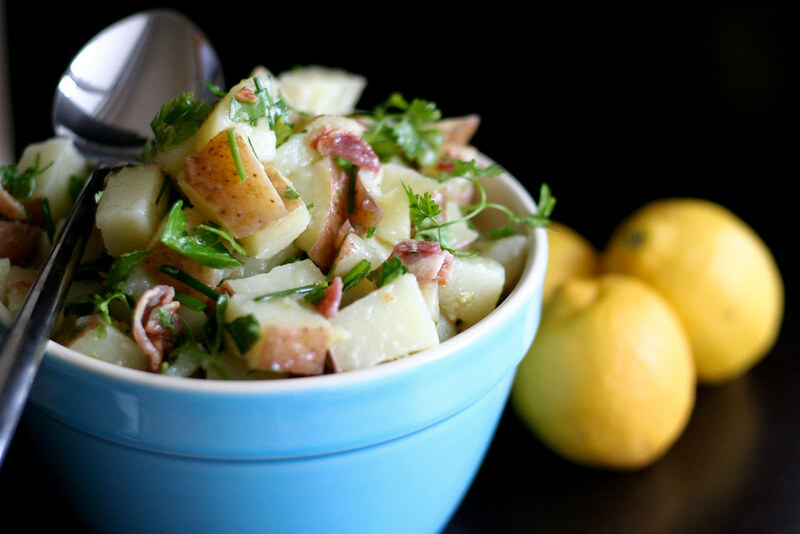 While your potatoes are cooling, cook the pancetta and make your dressing. Dice the pancetta and cook it in a pan until all the fat renders and the pancetta starts to crisp and turn golden-brown, about 8 minutes. Set aside. In a bowl, whisk together the olive oil, lemon juice and zest and salt until emulsified. Pour the cooled pancetta and rendered fat into the bowl along with the chives, chervil and parsley. Gently whisk together. Toss the potatoes with half of the dressing, then taste. You may need to add more dressing. Otherwise, refrigerate for up to week (it’s great on salads!). Makes 8 – 12 servings. This looks amazing and going on my must eat list. Love your blog and keep up the great work! This looks great! I am also constantly looking for tasty and easy dishes to bring to potlucks. I look forward to trying this. I made this tonight but I omitted the meat. It was so delicious!! Thanks for a great recipe. Can I ask what type of cookware you usually use? 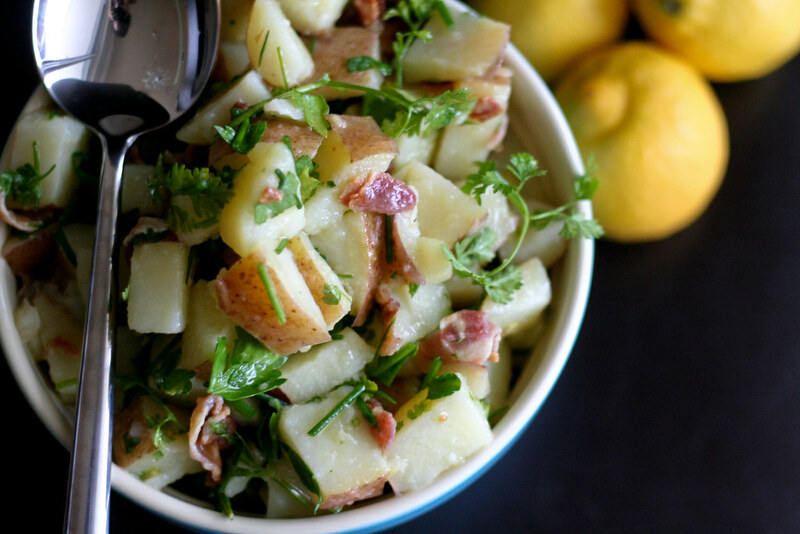 This is the first potato salad I’ve raised an (favoritive) eyebrow at, I think because a.) pancetta and b.) no mayo. :) I’ll try it with the potatoes in my CSA this week! Wonderful to find a delish potato salad without mayo. Just printed and will make this weekend. Thank you!